Hey there! It's Niki here today and I have a school layout to share today. I know school photos and layouts are usually more common in September, but we have our school photos taken in November and I didn't receive them until January! I don't always like school photos, mainly because I don't like school uniform all that much, so my policy is that they have to be scrapped immediately, otherwise they never get done. To apply the paint to put a small amount onto a piece of packaging. I then add water if necessary. I tend to find that the Shimmerz Paints need a bit of water added to make them more fluid. The Vibez sprays don't usually need any water added. I apply one colour at a time and if time is on my side, I let each colour dry before applying the next colour. After adding the large areas of paint, I then added lots of splatters. Once dry I then added my photo and embellishments. I really love the lime green colour in this layout with the birght yellow, it gives a slightly alternative take on the usual primary colours! I added paper strips at the top and the bottom of the layout. I got my photo and embellishments all stuck in place, and then realised I have covered up most of the background! This seems to happen to me quite a lot. So I added in lots of extra splatters around the edges of my photo and embellishments. I love the way the splatters dry...you can really see the beautiful shimmer in these paints. 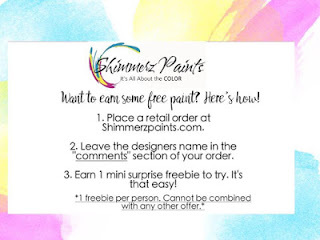 Thanks so much for joining me today, I hope you have enjoyed this school layout and don't forget that if you place an order via the Shimmerz website, enter my name in the comments for a freebie.